I was quite smitten with Coleridge Taylor in Last Words, and was glad for the opportunity to read and review Rich Zahradnik's second book in his series, Drop Dead Punk. I can just imagine this is a mystery series my dad would have enjoyed, Coleridge Taylor being his kind of guy. Not to mention the time period, mid-1970's. With the newspaper business already having taken a hit with the advent of television, and a city that is falling apart at the seams in near financial ruin, times are tense in 1975 New York City. Crime reporter Coleridge Taylor is more concerned about the city's crime than he is the city's financial woes though. When he comes across the scene of a murder of a police officer by a homeless man not known for being violent or a criminal, Taylor smells something fishy and decides there may be a bigger story there than at first meets the eye. He would be right. The partner of the dead cop, Samantha Callahan, has two strikes against her. Not only is she a woman in a male dominated profession, she is also being blamed for his death--why didn't she back him up when he came across the mugger? Taylor cannot resist an underdog nor a good story, and so he and Samantha join forces to uncover what really went down. Taylor's investigation is complicated by more personal issues: his broken heart and the financial state of the newspaper he works for. He doesn't know how much longer he will have a job. Drop Dead Punk is high in intensity and intrigue. This series is set in a time when leg work and in person interviews are the best way to get answers, and Taylor does a lot of that. With each lead Taylor gets, the more complicated the mystery becomes--and the more danger he finds himself in. There is nothing light about this mystery. It is a very dark time in history and the corruption and crime Taylor is up against is very serious. I found my pulse racing during some of the tight spots Taylor found himself in, and hoping he would make it out okay. Coleridge Taylor continues to be one of my favorite crime reporters in a series. He is ambitious and yet also has a strong sense of right and wrong. He believes in finding the truth and reporting the truth, qualities I admire. I appreciated how these values came into play over the course of the novel, not always being easy to maintain, especially the more dire the outlook for Taylor on both a professional and personal level. He is a complex person, like any of us, really. 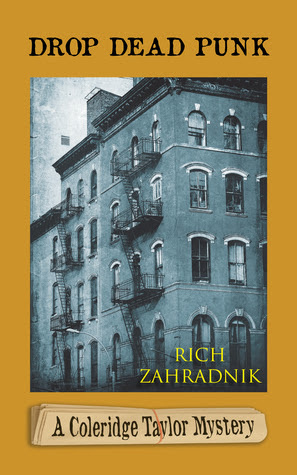 Zahradnik captures well the time period, both in tone and atmosphere: from the city politics to the financial downward spiral of one of the biggest cities in the country, to the impact it had on all levels of society. He also takes us into the heart of the punk scene of the mid-1970's, with its anti-establishment values and rock music scene. I felt like I was right there in the thick of it. I thoroughly enjoyed Drop Dead Punk. Author Rich Zahradnik has written another intriguing historical mystery that had me sitting on the edge of my seat. I look forward to reading more by him in the future. To learn more about Rich Zahradnik, and his work, please visit the author's website. In many ways crime fighting was much more exciting before DNA, security cameras etc. so I'm quite intrigued about this book set in the 70s. Cleo - It does seem that way, doesn't it? More legwork, for sure. Probably more difficult too in many ways, especially in terms of gathering evidence and proving guilt. I don't know quite why but having seen the title of this book I was expecting something totally different - a novel for YA maybes? A cover and title that for me somehow or other don't gel. I'm glad that the book worked well for you. This definitely looks fun. I love an investigative reporter detective and this time period is definitely interesting. It sounds like something my mother's husband would enjoy. He's a big mystery reader and a reporter as well. Katherine - I really enjoy this series so far. That time in history is not one I know a lot about (even though I was alive then--my parents were more in the thick of it being adults). I find it so interesting. Not to mention the books have a great set of characters that are hard not to like. Plus, I've always liked mysteries involving reporters. The premise and the setting, as well as the characters, all sound intriguing to me! I may want to read this at some point. Thanks for your lovely review, Wendy! Melody - This book and the first in the series are worth checking out if you get the chance. It's one of those series I really wish I could share with my dad so we could talk about them together. Jenclair - I am glad the second book lived up to the first! Great review! Another one of my list of mysteries to check out! Iliana - Thank you! I hope you do give this series a try, Iliana. It's so good! Drop Dead Punk sounds like a gritty mystery, I like the sound of the 70's punk scene in NYC. Naida - I really enjoy this series, including this addition to the series. It's worth checking out if you get the chance. I hadn't heard about this series but this one sounds like a read I'd enjoy. Lisa - I hope you do check it out!